If you think by writing about personal issues involving personal tissues twice in three days I’m developing an unhealthy obsession, you are correct. But like a bad cold, it’s something I can’t shake. Oh, how I only wish it were a common cold. At least then I’d know where to go. Straight to Mom’s Kleenex castle. When well meaning people ask me how she’s doing these days I usually just say she’s doing her best to make crazy contagious. It’s working with me, at least. Call it dementia or early Alzheimer’s onset. I call it crazy. And it is indeed viral. The trigger with me is Kleenex. She says she needs three boxes a week. She lives at her condominium home mostly with my dear second cousin, a 22-year-old godsend who’s staying with Mom while she’s looking for work. I say selfless prayers that Trump hires this sweet, energetic girl -- the day after Mom’s funeral. And just when will that be? God only knows. Instead, I’ll offer a black humor example from my own mother who seeded any wit imbued in my life. I’ve never written about this stuff before. She was saddled with caring for her father for three years until his 2009 death at the age of 97. Unlike her, his mind was firecracker crisp right up until the bitter end. A pity it was. He still had 11 years to go. About eight months before he died, he told my mother, “You know if it wasn’t such a disgrace to the family, I’d --” he made a slashing motion with his right index finger across his left wrist. It was hilarious, only slightly less so when three months later he locked the bathroom door, climbed in the tub and made a slashing motion across his left wrist with something sharper than his right index finger. To his furious shame, he survived. I remember picking him up from the emergency room -- as per stipulations in his living will, they didn’t even stitch him up -- and helping him into the car. I asked if he was going to put his seatbelt on. “Ha, ha,” was his sarcastic reply. One more story from that indelible day. Famished and overwrought, I went out for some sushi for Mom and me. We ate it bedside as Papa lay there weak and mortally embarrassed. The sight of an unusual food perked him up. What is that, he asked. Those hopes were dashed when I asked what he thought. So there’s a strain of gallows humor in our family. I wonder if I’ll have enough of it to get me through. 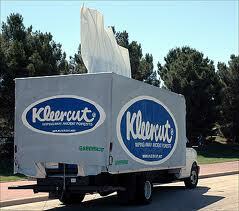 I wonder if I’ll have enough Kleenex. I doubt it. She needs Kleenex the way fish need water. As previously mentioned, she lives alone, has only one nose and there’s no evidence she’s decorating a parade float in her apartment. Yet, she maintains she needs three boxes a week. So Kleenex has become our tissue-thin mother/son flashpoint. Gold medal Kenyan marathoners don’t run as much. So in a fit of childish pique, I raced to the grocery store and purchased $17.35 worth of Kleenex; nine boxes, 1,458 individual tissues. It’s a good thing one of my best traits is self-forgiveness because I’m ashamed of what I did next. I stacked the boxes in a little tissue pyramid on her dining room table and said, there, now you have three months supply. That gives you 16 per day. Yes, I even did all the lousy math. Happily, she laughed at me and my absurdity. She’s always fretted her nose is her most dominant feature. She's way off. Her warm smile’s always been her most dominant feature. She blows her nose. She blows my mind. Great article Chris. I believe we could seriously start a "taking care of mom" support group. I may take my show on the road. Wanna join me? Napkins are our sore spot!!!! Yes, we'd need a big room for that one, wouldn't we? I'm hearing from lots of people in the same sad boat. Thanks for checking in. I hope you'll refer worthy posts to friends!